Curt Levine is a unique man whose story has a few big surprises. Levine can be found casually minding his booth, The Giving Tree, each Saturday at the Scripps Ranch Farmer’s Market. At first glance, a visitor might see what appears to be an assortment of rustic furniture on display. But upon closer inspection, one will become entranced by a display of extraordinary craftsmanship. Levine, also known as the “willow dude,” makes all kinds of intricately-built furniture, mostly by twisting willow branches. These creations are surprisingly sturdy. They are so interesting and functional that a Hollywood movie studio often contacts Levin to place orders of his furniture for their sets. Bird houses at The Giving Tree booth feature removable floors for easy cleaning. Just as interesting is the reason Levine became involved in his craft as a means of income. He was once a jockey in Canada. He had a flourishing career for 18 years until he broke his neck in an accident. “I was injured, I knew that (my career) was pretty much history. So, I waited about eight months and started playing around with it,” Levine said of what started out as his hobby. Eventually, Levine created a surplus of items and one day his wife suggested he sell some of them at a farmer’s market. 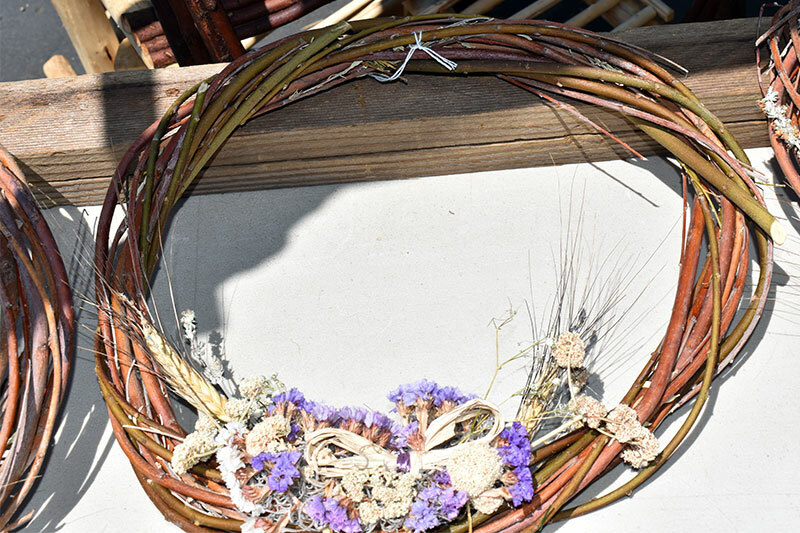 Decorative red willow wreathes feature dried flowers and lavender accents. Now, Levine grows willow trees near his home in Pine Valley and collects branches for his projects. He shapes them to make strong arm rests and back rests for furniture. “It’s cut fresh and it’s very pliable,” he explained, adding that he places partially finished branches in barrels of water overnight, so they will remain fresh until the next day for added work. 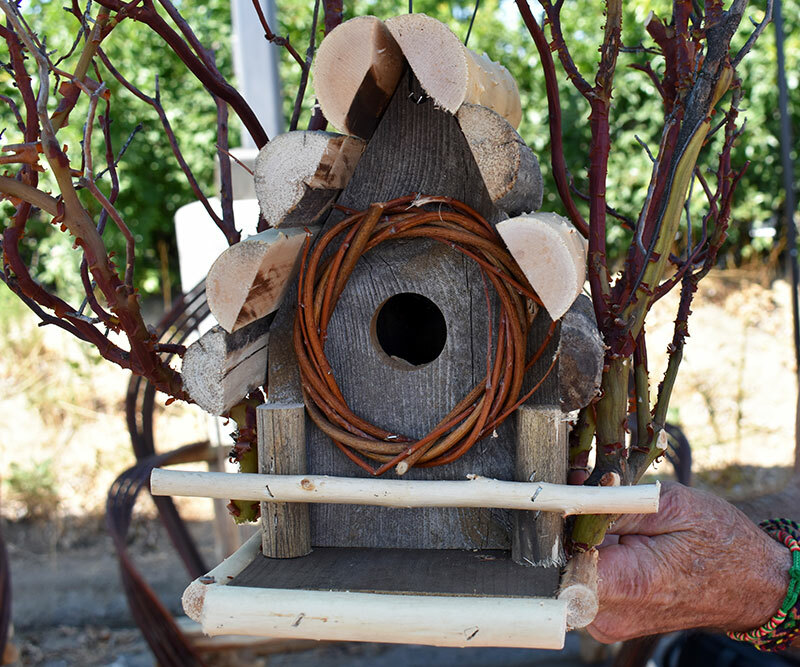 Levine builds everything from decorative red willow wreathes, bird houses, towel racks and magazine holders to end tables, chairs, love seats and garden arbors. He makes highly-detailed bird houses. The bottoms of the structures can be removed for cleaning. Most of the bird houses include special cedar bark. “What’s kind of neat about the cedar bark that I use is it made it through the Cedar Fire. So, I incorporated some burnt bark,” Levine explained, referring to the historic wildfire of 2003. Levine’s rocking chairs and love seats are incredible, especially due to the fact that they are so strong and well-made. His furniture can be either used inside or outside a home. He said the furniture requires little to no maintenance. Some pieces with bark should be oiled periodically. 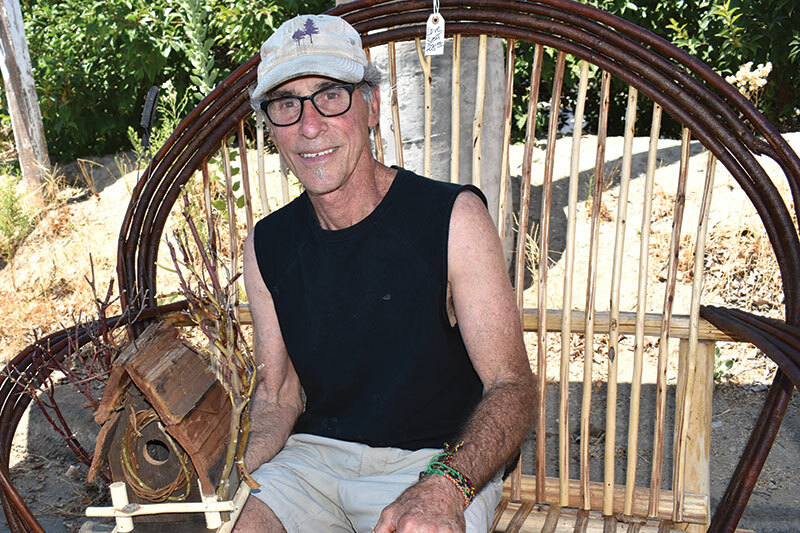 Levine said he is the only willow furniture maker in California, and he sells wholesale to the public. Items recently displayed at his booth included an inlaid end table ($165), a rocker ($225), an easy chair ($175) and a love seat ($275). Find The Giving Tree booth at the Scripps Ranch Farmer's Market, which is open for shoppers from 9:30 a.m. to 2 p.m. every single Saturday at 10380 Spring Canyon Road, in the Innovations Academy parking lot. Visit srfm.org.